[Photo] The Tsavo Man-Eaters on display in the Field Museum of Natural History in Chicago, Illinois. Date: 26 November 2006. Photo by http://en.wikipedia.org/wiki/User:Mikedk9109 Rights: Released into the public domain (by the author). In March 1898, during the building of the Uganda Railway, engineer Lt. Col. John Henry Patterson led the construction of a railway bridge over the Tsavo River in Kenya. During the construction period, many railway workers were killed by two maneless male lions, which dragged men from their tents at night and devoured them. The workers built bomas (thorn fences) around their camp to keep the maneaters out; but the maneaters were able to crawl through. Patterson set traps and tried several times to ambush the lions at night from a tree. After repeated unsuccessful endeavors, he finally shot the first lion on 9th December, 1898. Three weeks later, the second beast was found and killed. By that point, the maneaters had killed 135 workers according to Patterson's calculations. There is speculation that the maneaters in the region had developed a taste for humans as a result of the slave trade. Another theory suggests that an outbreak of rinderpest disease had decimated the lions' usual prey, forcing them to find alternative food sources. Upon examining the skulls and jaws of the lions in the 1990s, some scientists concluded that the two were suffering from abscesses in their gums, and were in too much pain to hunt tougher animals. This theory was in fact discussed on the National Geographic Channel explaining how abscesses in the gums force the lions to take on easier prey, both "slower and more fragile". There has also been a confirmed link to the man eater attacks in Tanzania. Both lions were maneless and had abscesses in their gums. 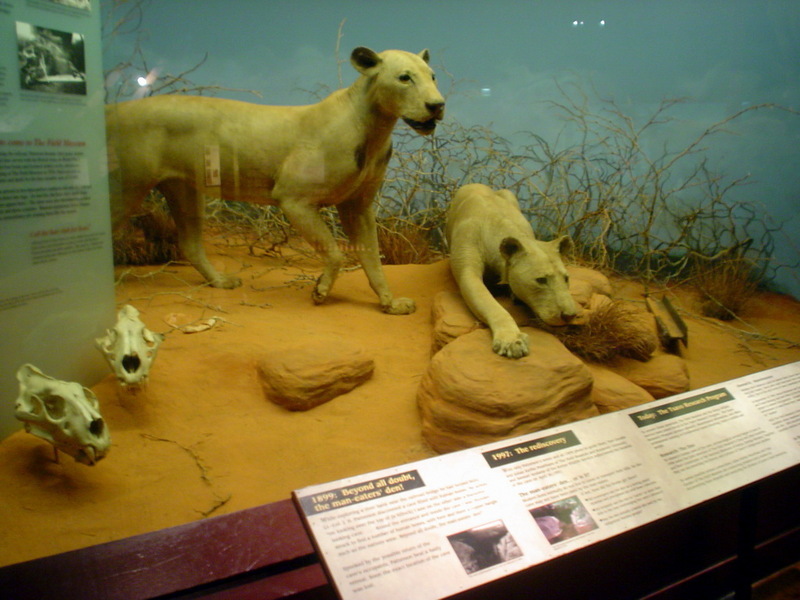 In 2000, a proposal was submitted to the Chicago Field Museum of Natural History that the attacks could be related to the lions scavenging the bodies of improperly buried railroad workers. Museum staff made a comprehensive review of Patterson's journals in which he recorded that many burial mounds, made by piling rocks over bodies, had been disturbed and the bodies eaten. Based on this evidence, it is most likely that the two bachelor males had acquired a taste for humans by scavenging the graves of deceased railroad workers, eventually modifying their feeding behavior to the snatching of sleeping workers from their tents. This explanation is now included in the Museum's display. After two-and-a-half decades as Patterson's floor rugs, the lions' skins were sold to the Chicago Field Museum for a sum of $5,000 US. They are currently on display there. Patterson's accounts were published in his book The Man-Eaters of Tsavo and later dramatized in the movies Bwana Devil and The Ghost and the Darkness. ("The Ghost" and "The Darkness" were names given to the two man-eating lions). The Tsavo maneaters were maneless male lions and were above average size for their kind. Patterson claimed that the lions were able to withstand several shots from his rifle. Tsavo Lions are generally maneless and also larger and more aggressive than lions from other regions. I read about these two lions years ago as a kid in an issue of "Outdoor Life" magazine, and the story scared the crap out of me ... these lions became the villains of my nightmares as a kid. When the movie :The Ghost and The Darkness" came out, I was elated. Now my childhood nightmare was finally up on the silver screen! Realize, that to make full mounts from skins that were trimmed for rugs was a major accomplishment! The skins arrived in less-than-perfect condition - old and dry, they had been cut down into rugs. (In real life the lions were even larger than they appear as taxidermy mounts.) The skins were also blemished by gunshot wounds and thorn scratches. Museum taxidermist Julius Friesser did an extraordinary job creating the life-like mounts you can see at The Field Museum. So the fact that we have them to look at, at all, makes these mounts even more valuable!